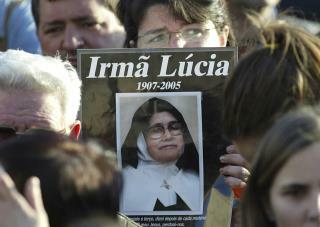 (Newser) – Catholic Church officials in Portugal said Monday they have assembled more than 15,000 pages of testimony and documentation to support the proposed beatification of Sister Lucia, one of three shepherd children who said the Virgin Mary appeared to them in the town of Fatima in 1917. The officials said the case for Sister Lucia's beatification—the first step toward canonization as a saint—will be sent to the Vatican's Congregation for the Causes of Saints, in line with church procedure. Her cousins Francisco and Jacinta Marto, who also said they witnessed the apparitions, died at ages 9 and 11 of pneumonia during the 1918 influenza pandemic. They were beatified in 2000, reports the AP. These people ARE seeing . . . something. As with the children, now adults, in the Medjugorge [sic!] Yugoslavia area, the famous Virgin of Guadalupe in Mexico -- was it in the 1500's? -- the Song of Bernadette . . . Something is Going On. And it's always the familiar message: "pray the rosary [sorry not completely familiar with the Catholic traditions], do your penance, do good deeds." Not bad advice if we can recognize Right from Wrong (harder to do in 21st Century 'murca). And look at those Commandments -- all good advice. Someone is trying to let us know that niceness counts! We keep saying there's not that much difference we would recognize between the All Knowing, All Seeing Eternal Omnipotent Creator of the Universe, and someone who might be visiting, just a few millenia ahead of us on the evolutionary scale. "Any sufficiently advanced technology is indistinguishible from magic." -- Arthur C. Clarke. People are entitled to their own version of religious faith, those who oppose, whatever nothing you deem to cling to in your own mind is your business. What I find amusing is when the subject comes up the ones that are always belly aching about others belief in religion as if they have something to prove. See their trying to prove something, when they believe there's nothing. Kind of contradictory isn't that something?